At first glance, we can see that the Bosch CORE18V Battery offers 0.3Ah over their previous 6.0 battery, which doesn't seem like much of an upgrade, but apparently, there is much more going on inside than just a bit more capacity. Bosch says their new battery delivers up to 20 percent longer runtime than previous-generation Bosch 6.0 Ah batteries. To increase efficiency the cells in the battery are laser-welded and rail-connected, which has the benefit of lowering resistance. A lower resistance should reduce heat build-up, which also benefits batteries. And it is also possible Bosch is using a more efficient battery cell than what is currently being used. In independent testing, Bosch's CORE18V battery delivers 50% longer runtime than their 5.0Ah competitor's offering and 20% longer than 6.0Ah. At the same time, the Bosch batteries are 24% lighter and 35% smaller than the competition. This again leaves me to believe that Bosch is using a different battery cell. 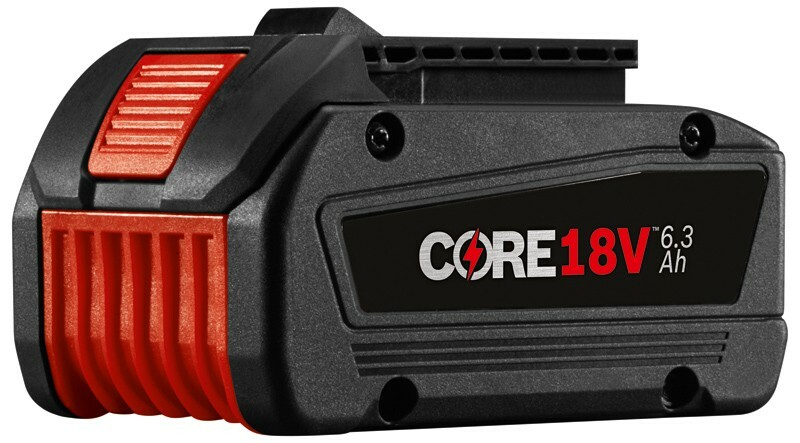 The most important thing for tool users, though, is that the new CORE18V batteries are completely backward compatible with existing Bosch tools and chargers. Though, using the optional Bosch BC1880 18V Fast Charger, the CORE18V battery can reach an 80% charge in 41 minutes or a full charge in 55 minutes. 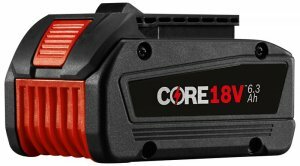 The new (GBA18V63) CORE18V batteries will retail for $149. You can visit the CORE18V Bosch page for more stats and information.